No matter if you’re a blogger, freelancer, startup, or established brand, when you look for a reliable VPS provider to power your website, one of the most important factors you will look at is the amount of bandwidth a VPS provider includes on a monthly basis. In the web hosting industry, bandwidth refers to the amount of data that can be uploaded and downloaded to a server per month. So, for instance, if you have a VPS plan which includes 100 GB of data-transfer per month, then the total amount of data that can be uploaded and downloaded in a single month should be 100 GB. Let’s say you upload a 2 GB video onto your website through your server. So if the file is 2 GB, the maximum number of times your website visitors can download that video would be 49. This is obviously a problem for video-sharing sites, and really any website in general that receives a large influx of traffic on a regular basis. A VPS provider who offers unlimited bandwidth solves this problem. A network’s uplink speed is a pivotal factor that will go into the quality of bandwidth you will receive from a hosting provider. Uplink speed is measured in megabits per second (Mbps or M/bs), and refers to the rate at which data travels to and from a web server every second. Transfer speeds commonly used by VPS providers, their data centers, and the underlying network carriers are 10 Mbps, 100 Mbps, 1 Gbps, and up to 10 Gbps. Generally, 100 Mbps and above are considered fast connections. Unlike bandwidth, network speeds cannot be unlimited since there are actual physical limits to what the company’s hardware can do. Choosing the right VPS provider who offers unlimited bandwidth boils down to understanding a few simple factors. • Port Speed – At least 100 Mbps is optimal. • Price – Less is not always more. • Virtualization Technology – KVM, Xen, Hyper-V, or OpenVZ? If you’re a developer or designer, you will probably want to avoid OpenVZ containers due to the lack of customization options. • Quality – Is the provider using the latest hosting equipment? Are they resellers? Are they a well-established business with years in experience? • Location – Does your VPS need to be offshore, in a specific country or region? Do you want your server to be housed in a country notorious for fast internet connections? • Storage – What is more important to you: A smaller amount of speed-optimized SSD space or a larger amount of standard HDD storage? Not sure where to turn next? 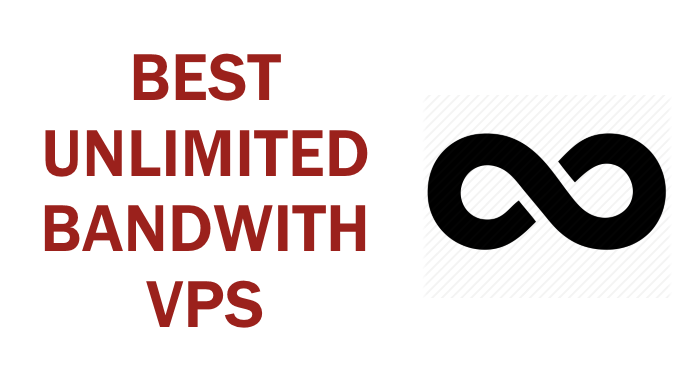 Feel free to check out our comprehensive list of the best unlimited bandwidth VPS providers in the industry, ranked with the above factors in mind. New to the industry, BizzaHost was formed in 2016 and is based in Fountain Valley, California, USA. Unfortunately BizzaHost provides practically no information on their data centers, hardware, or port speeds, and they also appear to be resellers. Each VPS comes with a free SSL certificate for life. It is unfortunate that BizzaHost is a reseller since this can have a negative impact on your own resources – this includes bandwidth allowance, even if a hosting provider does state that they offer unlimited bandwidth. Each VPS includes cPanel and FTP access, but comes with a “semi-shared” IP address. Decent hosting provider, cheap prices. Arvixe has been accumulating industry awards and accolades since 2003, and was even featured in Inc. magazine for being one of America’s fastest growing privately-owned companies. The purchase of any new hosting plan from Arvixe gets you a free domain for life – not too bad. It’s hard to argue with the notion that Arvixe should be ranked higher on this list, considering the large amount of freebies they include with each Windows and Linux VPS. Weekly backups, a free lifetime domain and SSL certificate, Softaculous, and $200 in Google Adwords and Bing credit are a just a few of the perks that come with being a Arvixe customer. 15 GB in extra storage space costs an additional $10 per month while more RAM comes with a $20 monthly price tag. This brings us to our next point: While Arvixe may be good, they are not the most cost-effective VPS solution for unlimited bandwidth. ZetServers, founded over ten years ago as a subsidiary of NetAction Telecom, is headquartered in Lipova, Romania. The company maintains its own servers in multiple data centers across the globe, including in: Romania (NXDATA2 Peering), the Netherlands (EvoSwitch), Germany (EvoSwitch), Washington D.C. (EvoSwitch), France (OVH), and Canada (OVH). ZetServer’s unlimited monthly bandwidth feature is available on both SSD and SAS drives, in addition to being compatible with both Windows and Linux OS. They use Xen HVM and Xen PV virtualization technology, which guarantees CPU resources are shared between neighboring virtual servers, so overcrowding servers is never a problem. VPS9 is a privately-owned web hosting company founded in 2010 and primarily based in India. They have access to servers in multiple data center locations, including in the USA, Netherlands, Germany, and Russia. VPS9 is well-diversified, offering both Linux and Windows VPS solutions using Xen and OpenVZ technology. Whether you resource needs are small or large, VPS9 has you covered. Their Netherlands-based VPS plans are the best value buy and include a high level of quality (SSD drives with 1 Gbps network uplinks). Several add-ons are available, which include: 1 dedicated IP for $3, extra SSD space at just $3 for 10 GB, an additional 1,024 MB RAM for $5, and an extra CPU unit for $5 per month. The only downside to using VPS9 is that they charge for a control panel, which can cost between $5 to $20 for a lifetime license. OVH is a well-established global hosting provider, which was founded in 1999 and is able to accommodate over 1 million servers thanks to their 20 global data center locations. The company also stands out through its 7.5 Tbps network capacity, made possible by being one of the few hosting providers in the world to deploy and maintain its very own global fiber-optic network. VPS packages are compatible with Windows and Linux OS across 16 different locations, and offer clients the choice between SSD drives, Cloud, and RAM-centered cloud VPS solutions – all of which come with unlimited bandwidth. Additional disk space comes at a very reasonable charge of $7 per 50 GB a month. Overall, OVH is a technologically sophisticated hosting provider with the ability to accommodate everyone from web developers and designers to large multinational corporations. SeverHosh has been a registered company in India since 2012. While ServerHosh has servers in three USA data centers, their focus lies in their Rotterdam, Netherlands Tier-3 facility, where they tap into multiple Tier-1 internet providers and exchanges with a network backbone capable of delivering 1 Gbps to 10 Gbps port speeds. For 10 Gbps uplink ports, you get access to better hosting technology, but are limited to between 2 and 25 TB in monthly bandwidth. The VPS plans above utilize KVM virtualization, but they also have a less expensive OpenVZ option for their Netherlands location. High quality hosting provider offering unlimited bandwidth on VPS packages, well-diversified and secure, recommended. Arguably the largest hosting provider on this list, DreamHost was founded in 1997 in a university dorm room. Today, the company is based in California, USA and hosts over 1.5 million websites. They have received numerous awards within the web hosting industry. Their budget-friendly VPS plans run on Ubuntu 12.04 and use the DreamHost control panel. Each VPS from DreamHost also includes a free SSL certificate, dozens of applications, and the ability to upgrade a standard MySQL server to a MySQL VPS, wherein the MySQL runs on its own isolated virtual server, which reduces noise, improves performance, and allows you to send larger amounts of data between apps and the MySQL. Unfortunately Colour.Hosting does not provide much information detailing their hardware, data centers, or date of inception. Though the company is registered in the UK (UK00003164921) and also accepts Bitcoin. Colour.Hosting’s unlimited bandwidth VPS packages also include full root access, anti-DDoS protection, an IPTables Firewall, as well as CentOS, Debian, and Ubuntu operating systems. Though they also enable the Windows 2008 and 2012 OS, it comes with a $24.99 price tag. Free control panel options include Vesta, ISPConfig, CentOS Web Panel, and Webuzo. Other control panels can also be purchased, such as: cPanel ($24.99), Plesk ($9.99), and WebAdmin ($4.99). Aside from offering VPS plans optimized for speed (SSD) and bandwidth power (10 Gbps), JavaPipe also has SATA-based virtual servers that come with huge amounts of SATA storage. Each VPS also includes a Vesta control panel and free lifetime SSL certificates. Dedicated IP addresses cost an additional $5 per month while configuring your server with Windows OS comes with a one-time $10 setup fee. JavaPipe accepts Bitcoin and is very developer-friendly. DigitalBerg was established in 2001, is based in the UK, and services over 400,000 clients across over 90 countries. The company maintains its own hardware in various data centers worldwide, with available locations including: Leeds, Derby, Frankfurt, Amsterdam, Riga, and New York. DigitalBerg’s cloud-based virtual private servers come equipped with a free Plesk 12.X control panel for 10 domains, fully dedicated resources, a manual hard drive snapshot feature, and are compatible with six different operating systems, including Windows Server 2008 and 2012 R2. A dedicated IP address costs $2 per month while an optimized cPanel license costs $15. We like that DigitalBerg gives you the choice between 100 GB SSD or 200 GB HDD storage space for each VPS plan without affecting the final price tag. Quality service, growing company – highly recommended. Formerly branded as Fanatical VPS, AfterBurst started in 2010 using a single server and one administrator. Since then, the company’s reach has expanded exponentially, with their international client base praising AfterBurst for their stable network and knowledgeable staff. AfterBurst manages its own servers in two data centers featuring redundant fiber optic connections, including: The Deutschherrnakarree in Nuremburg, Germany (their flagship facility) alongside a New York, USA data center. Their unlimited bandwidth VPS plans are compatible with OpenVZ and KVM technology, each with identical prices. Each VPS runs on a Linux OS of your choice. And sure, while AfterBurst is not the most optimal VPS solution for larger businesses considering their resource contraints, their storage prices are practically unbeatable. Unlimited bandwidth using 1,000 Mbps network ports is also a nice step up from the commonly employed 100 Mbps uplinks. Excellent VPS provider offering unlimited bandwidth at affordable prices, decent hosting capabilities, and multiple server locations – great hosting solution for small to mid-size projects.